Should You Hire a Green Industry Business Consultant? Maybe you’re getting crushed by competition. Maybe you’re losing employees faster than you can hire them. Or maybe you’re just stuck in a rut and haven’t been able to grow as much as you would have liked to. All of these might bring you to ask yourself, should I hire a business consultant? Do I need outside help? As a green industry business owner, you do have access to a help from forums like Lawnsite, you can learn from publications like Irrigation and Green Industry and Lawn and Landscape. However, you might need someone who has the experience with other businesses to take a look at your operations, see where there are inefficiencies and help you right the ship. If you’re considering bringing on a consultant, here are five questions that you should ask yourself. This is a fairly obvious question, but possibly more important, do you know why or how? Is there a reason that you’re leaking money? If you can’t identify why, maybe you do need an outside perspective to point out areas that are inefficient in your operation. A business consultant might be able to find a solution to why you’re losing money. Are you growing our customer base? Are you gaining and retaining new customers? If you aren’t able to keep the new customers that you gain throughout the season, you’ll need to find the reason. Did you over-promise, but under-deliver? Someone with knowledge of other green industry businesses can help you find the reason why you aren’t keeping new customers coming back. Have you lost good employees? One of the points that we hear each year when we conduct our Green Industry Benchmark Report survey is that businesses have a tough time finding and keeping good employees. It winds up being a consistent issue for most employers. They struggle to hire quality employees. A consultant might be able to shed some light on both hiring new workers and keeping them on. They will be able to walk you through a training program and may be able to work with you to find a compensation package that will work for your entire team. Are you or your employees stressed out? Owning a business isn’t always going to be a walk in the park, but it shouldn’t be a constant struggle either. If you’re employees are constantly on edge and unhappy, you’ll be feeling the repercussions. Customer interactions won’t go as well as they should and that might compound into bigger issues. If your employees aren’t happy, you most likely won’t be either. A green industry business consultant can help you find ways to make your employee's lives easier. It might just take a simple change to an inefficient process. Are you hitting a wall? Not that hiring a business consultant needs to be a last ditch effort, but have you exhausted all of your options? Have you met with other business owners, spoken with people who have been in the same position as you? 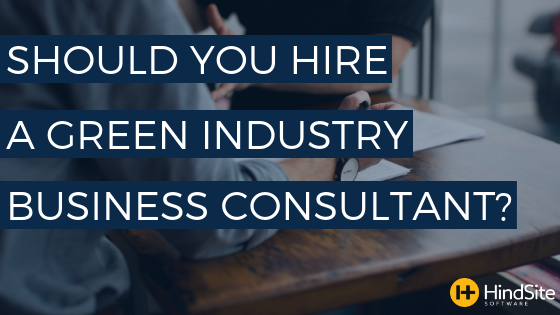 If you’ve been applying all the advice that you’ve received from other green industry business owners and other resources, but still haven’t been able to turn your business around, then it might be time to hire outside help.